And another week is here. Is it me or are these weeks just flying by?! This week I wanted to talk a little bit about recipes. I get many emails asking me how I avoid the dinner rut each week and honestly I think it’s just because I’m constantly trying new recipes. I know that scares many people but you’ll never find a new favorite meal if you don’t try new recipes. The way I look at it is this…some recipes are winners and well some are not but what we are is never bored 🙂 Of course it does take time to source out new recipes week after week (especially that meet my specific criteria) but as I find new favorites I add them to my Family Favorite Recipe Index. Then on weeks where I’m rushed and have less time to plan and look for recipes, I can just pull from our favorites list. It doesn’t take me any longer to prepare a new recipe than it does an old one. As long as I have a recipe to go by I’m good. Allergy Friendly, Appetizers, Beef, Breads/Muffins, Breakfast, Chicken, Desserts, Drinks, Holiday, Meatless, Misc, Pizza, Pork, Potatoes, Salads, Soups and Veggies. Some of the sub-folders even have sub-folders. Sure makes it easy to find what I need later. And so I never lose my bookmarks (again) I use Xmarks. Works great! Have a great week everyone. Also don’t forget to enter to win a seat in my latest organizing workshop giveaway! This giveaway closes on Tuesday, January 19th at 2:00 pm PST. I’m thinking of doing a variation on the shredded potato casserole you posted…. I have shredded potatoes that were free to us, and I need to use them up! I surfed around your site tonight and enjoyed visiting some of your favorite links – thanks for all the work you do!! Our family likes to try new recipes a lot of the times, too. If we like it then the printed recipe goes into a cover protected sheet within our family cookbook (no more hand printed 3x5s – course I kind of miss handwritten recipe cards). One of our faves Crescent Chicken Bundles sided with a green salad. Yummy! It’s funny, as much as manage so much information electronically, I’m still attached to print for recipes. I have 8 binders full of recipes that I’ve clipped or printed. I have an Excel sheet that provides details on all of them so they are easy to look through, but sometimes it’s just fun to sit and flip through them. Thinking about family favorites, I’ve discovered that we tend to go with variations on a few familiar themes — pork tenderloin, grilled steak, roasted chicken, etc — but there’s enough variation along the way to keep us from getting too bored. It really is a juggling act though to balance things a family will like with new recipes. Thanks for bringing up this topic – it’s given me something to think about. I might start bookmarking more of my family’s favorites online as well. Thanks for this invaluable resource, not too long ago I was searching for menu plans and couldn’t find ANY. Then I found your blog…sorry I can’t remember how. But I am sure glad I did!!! Week 2’s menu plan is posted. Last week went so much smoother knowing what was for dinner. Thanks again!!!!!!! Here is one of our favorite soups! Best pork chops I’ve ever tasted! I am surprised you aren’t using Evernote to keep your recipes organized. It is a fabulous way to organize recipes as well as many other things you may want to reference again (eg. crafts, books to read, etc). It can be used offline so it comes in handy if you ever don’t have internet access. There are a few more categories, but you can find them on my sidebar if you drop by:) Didn’t want to make this too long! 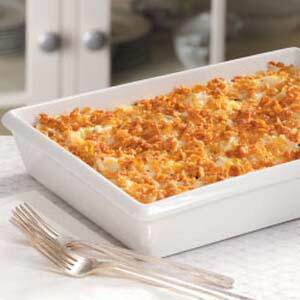 Wow, that potato casserole looks amazing. Missed posting last week….and so glad to see you post how you bookmark your recipes. My bookmarks need some serious help so I’m really looking at your method carefully. I’m also going to be putting a Family Favorites list on my site. 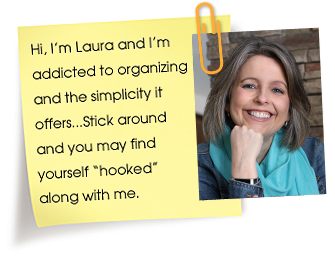 Thanks Laura for all the things you do! We are the same way!!! We do have our favorites, and are starting to link them online along with photos because I love when recipes come with photo so I can literally see how things are supposed to be coming along. We LOVE trying new recipe. One that I love is one of your favorites too I think. I got it from here anyhow…the teriyaki chicken recipe. And I was short on time once, so instead of doing a separate zucchini dish, I just tossed 2 sliced up zucchinis during the last 20 minutes of baking…I think I could possibly do 3 small ones next time for more veggies. It was delish!!! Mexican style ravioli looks great! I am soooo with you on the trying new recipes ! We probably average about 4 to 5 new recipes a week. Sometimes more, rarely less. There are just so many recipes out there !! So many different tastes to experience ! Here’s a couple you might like … I think they meet your specifications ! and I serve those meatballs with this …. I’m hungry now … good thing it’s just about time to start cooking dinner !! Your menu looks so good! I am going out of town to visit my mom, so most of this week’s menu plan in Mr. Sahm’s plan. He made a plan that the kids are sure to like! I was so proud of him, I had to include his plan in MPM! I hope to continue to post more! Thanks for all you do! This is a habit I am trying to get in a groove with. I started a new venture this month and am really trying to become organized. I don’t have recipes posted yet so check my site later in the week. I love this thing! I am doing new recipes every week…by the LETTER! This is Week C for us…chicken, crepes, chocolate, and chili! We found a new favorite last week (B) and made beef–steak au poivre. OMG was it good!!! I am working on losing weight so my dinners this week are all 400 calories or less per serving. Here’s one of my favorites: My Nana’s Banana Nut Bread. Have a great week Laura!! I have a huge binder of recipes that I’ve printed off from blogs, recipe websites etc. I also have a list of recipes I’ve found that I want to try and I try and include at one of those each week. I have my favourites and staples too that I cook again and again. I love that there is now such easy access to so many recipes with the internet. We’re always trying new recipes, too. Partially because I LOVE to cook but also because I grew up in a house where we always had the same thing. It’s really easy for me to get sick of the same food now! This week when I sat down to write up the menus I kept in mind that my husband is traveling all week. I didn’t even use a single recipe book for my menus. I consider this entire week “family favorites” and just picked meals that are simple and nourishing both to our bodies and soul. The kids and I miss dh so much when he is away. I love the family favorites idea; we are going to have to try it. Once I finish the pantry challenge my goal is to start trying new recipes. I feel like we are in a rut, but nothing we can’t change, lol! One of our favorites is on my menu plan this week – my boys can’t get enough of it and I grew up on it and still it never grows old – check it out!! My kids eat a lot of things most kids don’t, which is awesome, so you’ll see a lot of variety there. And everything is easy and CHEAP (I was going to say just like me, but ahem…). Stay tuned for exciting updates! And good luck to everybody else organizing their week. Online classes…what a great idea. I would attend but I start my new fulltime job. Any chance you’ll offer it as a podcast? Thanks for hosting! I usually try one new recipe or so per week, but it seems like things have been so busy lately I’ve fallen off the wagon a couple of weeks. Thanks for the inspiration to pull those cookbooks back off the shelf! This is my first time to participate. I’m excited. Thanks! I also love to try new recipes!! I think it brings a bit of excitement and change in my sometimes boring meals. I love the idea of getting all my favorites together online. I also have a binder that I keep all my favorites it and I love it. I will probably keep it going. I am working on transfering all my favorites to my blog a little at a time. Thanks for all the incredible ideas!! This is one of our new favorites: Green Beans, Ham and Potatoes. Easy, frugal and delicious! I don’t have a family favorite section on my blog, but the Potato Soup in this week’s menu is definitely a favorite. YUM! So excited to say that this is my first (of hopefully many) menu plan Mondays! Seems like a played a long time ago but this is the first time in at least a year and it’s on my new blog.. hopefully this time I’ll keep up! I’m off now to go see what ya’ll are having! I keep a running list of family favorites until I hit 31! If I find something great I add it to the list. My husband jokes that he’d better not tell me he likes it because it will get added to the favorites & put on the backburner until I run out of exciting new recipes. Oh Well! The macaroni & cheese & carrots fascinates me. I’ll definitely be checking it out. I’m feeling a bit more excited about week 2 of meal planning. Actually, I’m so excited that I spent Friday night planning through the first week of Feb. Sometime in the future, I’m going to have to sneak in that mac ‘n cheese recipe…. Sorry – Ours may have been entered twice due to confusion as to whether it made it through the system. Feel free to delete either one of the links! We will be challenged this week to stick to our menu as we deal with a surgery for our 2 1/2 year old and a possible deployment for Hubby. But, at least the plan is there… Plus, I had fun searching out some in-budget, easy Dominican recipes to help us celebrate Our Lady of Altagracia this week. The kids are so excited for the feast day on the 21st that we are preparing all week. hahaha oh man, I just accidentally left a comment on a post from July thinking it was current. I think that means I need sleep…. I love this website! Thanks so much for the recipe index. I am always looking for new, kid-friendly, easy meals. Can’t wait to check out everyone’s menu plans for the week. Maybe I should enter next week?? I LOVE this idea! I will definatly be returning next week! Here’s hoping that I can remember to post it each week!